Equipped with a Quad-Core ARM Cortex-A9 processor (RK3188), Quad-Core Mali-400 GPU and 2GB RAM, this industrial solution packs a tremendous amount of power that delivers optimum performance for a wide variety of digital signage projects. X7-i also includes 3 USB 2.0 ports, 1 OTG port, headphone and microphone jack, optical audio and Ethernet port. X7-i is equipped with an 802.11n Dual-Band Wi-Fi external antenna that works on both 2.4GHz and 5GHz, providing superior levels of Wi-Fi performance, reliability and stability. X7-i’s firmware has been specifically customized for the digital signage industry, offering both screen-rotation (portrait mode) and auto power-on as standard. X7-i is one of the world’s most energy efficient digital signage hardware solutions, consuming a mere three watts of power when idle. Its exceptional built-in thermal control management system protects against any heat issues, giving clients complete assurance that the device can be in operation 24-hours a day. 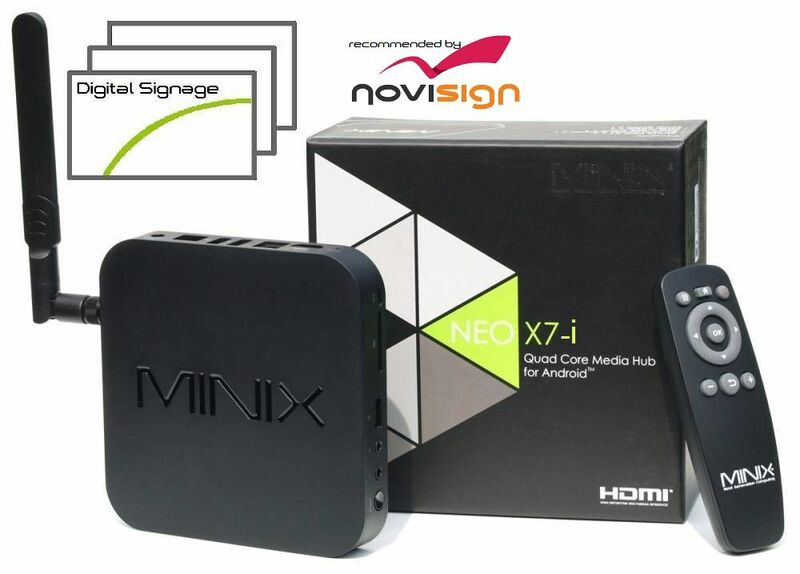 X7-i is only available to buy from selected MINIX authorized distributors. Full customization possible depending on order quantity – please contact our sales team directly for further details.